Clip. Clop. Clip. Clop. The speed at which the creature was dragging its feet was painful. It was almost walking backwards, downhill, rather than taking up to see magnificent views. Its legs were crumbling below, about to give way at any moment, as its age prevented it from moving any faster. I was bored. There was no denying the views were phenomenal, but I was bored. I craved speed, the trill that spreads through your body as you gallop off with no control. But nothing. As we plodded back to the yard, my ride was complete and I was most dissatisfied. After months of trying to persuade me to sit on a bike and go on a small spin with him, I finally gave in to Iñigo’s pleas. Suddenly, the object which presented itself as a danger to me, became intriguing. I abandoned my negative thoughts and stereotypes of the bike and looked at it with curiosity, seeing it for the first time as an object of beauty, of power. I was horny for velocity, for the buzz that comes when one is integrated fully with nature and not being trapped behind the windscreen of a car – what horse riding usually ignites within me, but failed so dreadfully that morning, and so my adventure began. I was scared. For once, I had to put my life in the hands of another and how he controls a beast of magnificent power, speed and size. When I ride a horse, I am in control (the majority of the time), I do not rely on someone else’s capacity to impose direction upon it, to make it do what I want, yet here I was vulnerable. I had to wholeheartedly put all my belief, security and essentially, life, in one person and his ability to protect me. 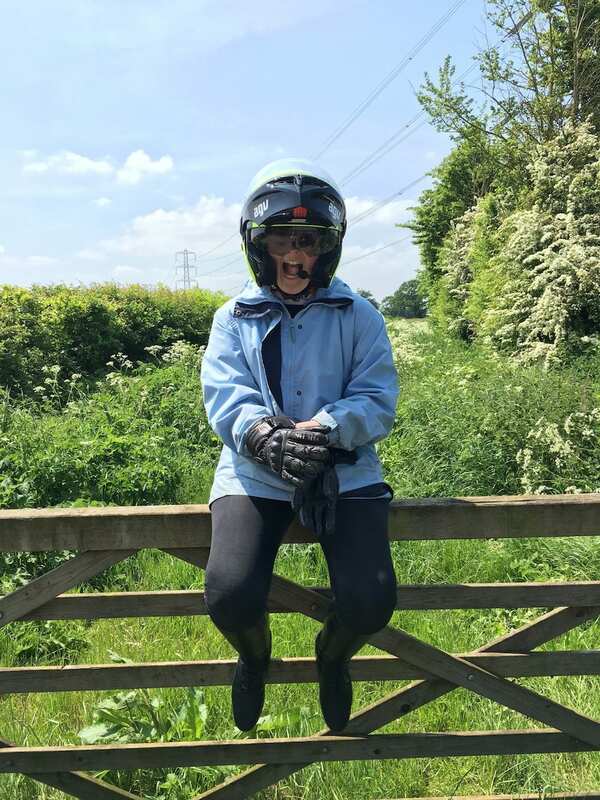 There is no denying that I am not the most trustworthy person, and not only that, but the voices in my mind had taken control and were swirling around shouting “she beat cancer, but she died on a motorbike”, but suddenly I thought, screw it! If there is one thing my disease taught me, it was to live and do things that I want to, because we could be taken at any point – on a horse, bike or walking down the street and quite frankly as Mark Twain once said, “only a man who lives fully is prepared to die at any time” – and so a few deep breaths in and one foot in front of the other, I walked towards the arms of a man that awaited me with a helmet. Dressed in riding boots and jeans, fully prepped on the activities ahead, Bluetooth on and sat on the back seat, the engine burst beneath us. Roaring loudly, everyone’s heads turned in our direction as we stood still in the car park. The vibrations itched themselves into me as every cell in my body felt empowered with energy. I was buzzing. I was raring to go. I wanted to see what this creature could teach me. Then zoom, we were off! Out of the car park to the right we turned, gradually picking up speed with every metre of ground covered. It was exhilarating, it was revitalizing and I finally felt a freedom like no other. Mimicking the flow of the bike from right to left, getting closer and closer the ground, faster and faster we rode and I realised that all my fears had escaped from within me. Suddenly, I no longer wanted to stop. I wanted to go faster, I was begging to feel at one with nature for even longer, to feel the wind hit my body with brutal force and remind me that I was alive. A quick tea break later and we off once again. Demanding to return via the longer route, the desire to experience this most intense feeling was like a drug, addictive as it captured me with all its might. Although the return to the hotel was far less than dry, as torrential down pours flooded the roads and my jeans stuck to my legs as if they were painted on, the trill of the throttle really did dig into me that day and I requested to return back to London by bike the following day. My first experience on motorbike was intense, it forced me to let go and trust someone fully in a way I have never had to do physically before. It captured my every sense and I was hooked. It is safe to say that it only took one more ride for me to book my CBT. ← Join us on our adventure!